Author’s Note: After taking Introduction to Microbiology (MIC 102), I became interested in microbes, living organisms that surround us but are largely invisible to the naked eye. One area of research that particularly fascinates me involves the use of microbes that naturally inhabit the human body to treat infections and diseases. 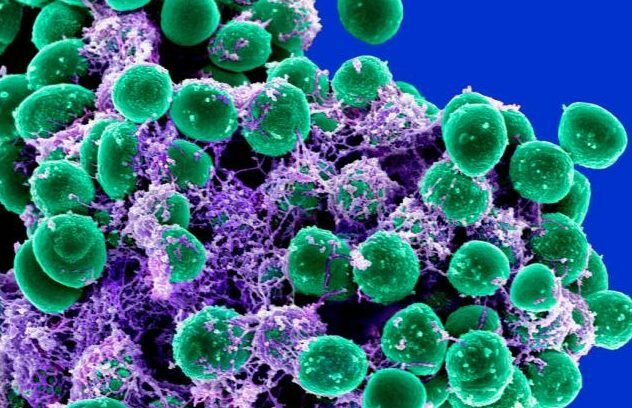 I wanted to share the findings of a research study focused on one such microbe, Staphylococcus epidermidis, because of the significant implications and potential for further development demonstrated by the research findings. Human skin harbors diverse microbial communities, and Staphylococcus epidermidis is one of the predominant bacterial species that colonizes the normal skin surface. Some strains of S. epidermidis are commensal and therefore benefit from inhabiting the human skin environment but do not harm the host. In a recently published research study, Nakatsuji et al. (2018) reported that specific commensal strains of S. epidermidis produce 6-N-hydroxyaminopurine (6-HAP), a molecule that is capable of inhibiting DNA synthesis selectively in tumor cells. The ability of S. epidermidis to defend against tumor growth possesses important implications in the future treatment of skin cancer. 6-HAP interferes with DNA synthesis because its molecular structure mimics that of adenine. Nakatsuji et al. found that in the presence of 6-HAP, DNA extension was blocked when the template required adenine to pair with thymidine but functioned normally during cytosine-guanine base pairing. Furthermore, 6-HAP disrupted DNA synthesis in a melanoma cell line but did not affect Normal Human Epidermal Keratinocytes (NHEKs). NHEKs are not susceptible to 6-HAP activity because they contain mitochondrial amidoxime reducing components (mARCs), powerful enzymes that reduce imitative compounds like 6-HAP to normal nucleotide bases. Consequently, 6-HAP is rendered to adenine in the presence of mARCs and DNA synthesis functions as normal within the cell. As expected, the expression of mARCs was discovered to be much higher in NHEKs than in the 6-HAP-sensitive melanoma cell line. The study suggests that 6-HAP is thus able to specifically target skin tumor cells to suppress their proliferation in culture. Nakatsuji et al. also investigated 6-HAP’s ability to inhibit tumor growth in vivo. Among mice injected with melanoma cells, some received 6-HAP injections while others received mock injections. The results showed that tumor size was suppressed by more than 60% in mice that were administered 6-HAP compared to those that were not. The research team conducted further experiments to examine how S. epidermidis affects the skin surface. Scientists topically applied S. epidermidis on hairless mice before exposing them to UV radiation for 12 weeks. While some mice received a S. epidermidis strain that produces 6-HAP, others got a strain that does not. Researchers found that mice colonized with S. epidermidis that makes 6-HAP formed tumors of significantly smaller size compared to mice colonized with the control strain. Predictably, the mice that received treatment from the 6-HAP-producing strain also developed fewer tumors overall. The research findings highlight the potential for S. epidermidis to protect against tumor growth and carry significant implications in the future treatment of skin cancer. Perhaps 6-HAP could be extracted from S. epidermidis strains and harnessed to synthesize skin cancer drugs. It is also plausible for S. epidermidis to be transferred from individuals bearing 6-HAP-producing strains to those who do not, as a way to ward off skin cancer. For now, these ideas are merely possibilities as additional studies are necessary to understand the biosynthesis and regulation of 6-HAP in S. epidermidis, as well as the interactions between bacteria and host. Undoubtedly, this discovery has opened doors by defining a new role for human skin bacteria as a line of defense. ⟵Could a DNA Sample Reconstruct a Face?